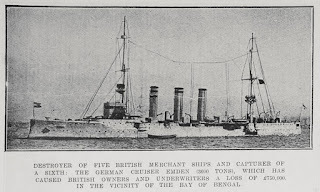 SMS Emden was a German light cruiser and commerce raider in the Indian Ocean during the early months of the First World War. 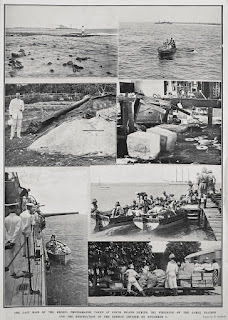 Ref: Auckland Weekly News, Destroyer of five British merchant ships..., 1 October 1914, Sir GeorgeGrey Special Collections, Auckland Libraries, AWNS-19141001-48-1. After destroying 25 merchant vessels and 2 Allied warships, Captain Karl von Müller of the Emden decided to sail to Direction Island in the Cocos Island group and destroy the cable station there, with the aim of disrupting Allied communications and making the hunt for his ship even more difficult. 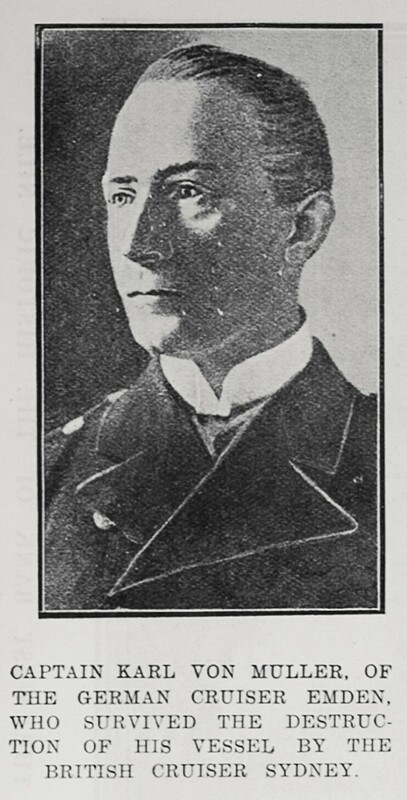 Ref: Auckland Weekly News, Captain Karl von Muller, 24 December 1914, Sir George Grey Special Collections, Auckland Libraries, AWNS-19141224-40-1. 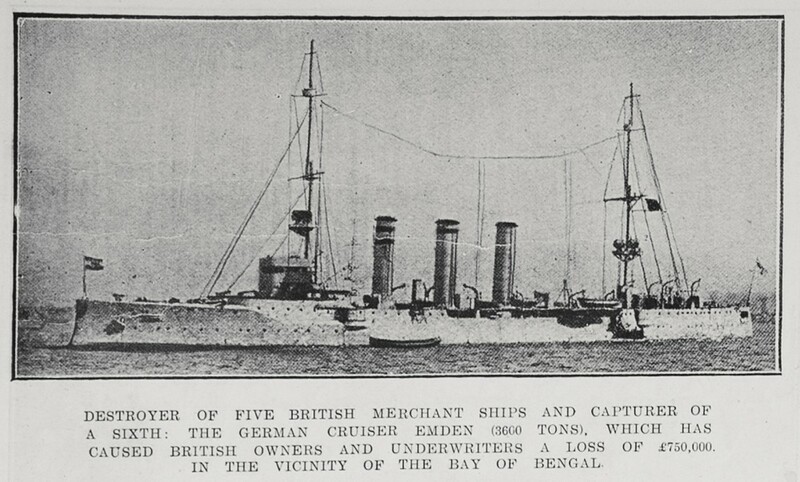 Emden reached Direction Island on 9 November 1914 and the ship’s First Lieutenant, Hellmuth von Mücke, was dispatched with a 53-man landing party to destroy the station and the intercontinental communications cable. 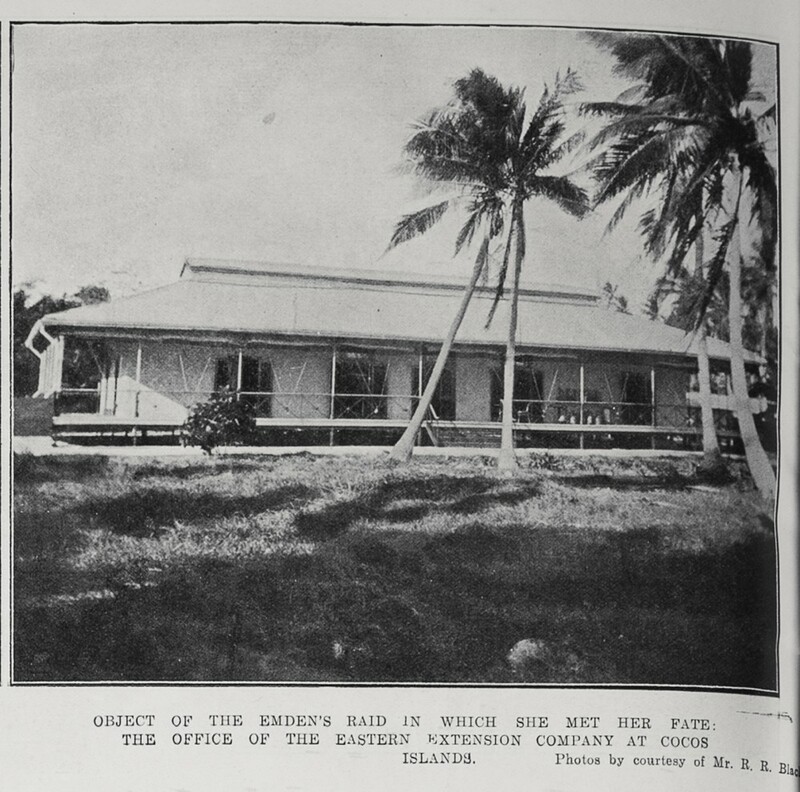 Ref: Auckland Weekly News, Object of the Emden's raid in which she met her fate, 19 November 1914, Sir George Grey Special Collections, Auckland Libraries, AWNS-19141119-46-2. When the landing party arrived in the lagoon at Direction Island they discovered a derelict schooner, the Ayesha, lying at anchor there. Von Mücke resolved to destroy the schooner as well, but fortunately decided that first the party should concentrate on the main task; the destruction of the communications station and cable. As the Germans landed a wireless operator had time to send out a message they were being attacked, and this message brought the Australian cruiser HMAS Sydney, which had been escorting the first convoy of New Zealand and Australian troops bound for Europe, steaming towards the island. Soon afterwards the landing party were ordered to urgently return to the Emden. However before they could reach her, the Sydney arrived. 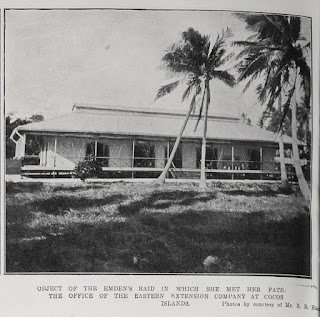 When the Emden sailed out to engage Sydney, the party returned to the island. Despite being invited by the station staff to a game of tennis, von Mücke apologised that he had more important things to do and went to observe the battle. From the roof of the highest house he had a grandstand view of the Emden and his shipmates being blown apart. The story of the Direction Island Cable Station and the Battle of Cocos Island includes Kapitӓnleutnant von Mücke’s report on the battle and how the landing party finally left Direction Island. Some of the photos in the following montage show the station and mast after being destroyed by the Germans. Now the Ayesha was their only means of escape – fortuitously they hadn’t yet scuttled her! 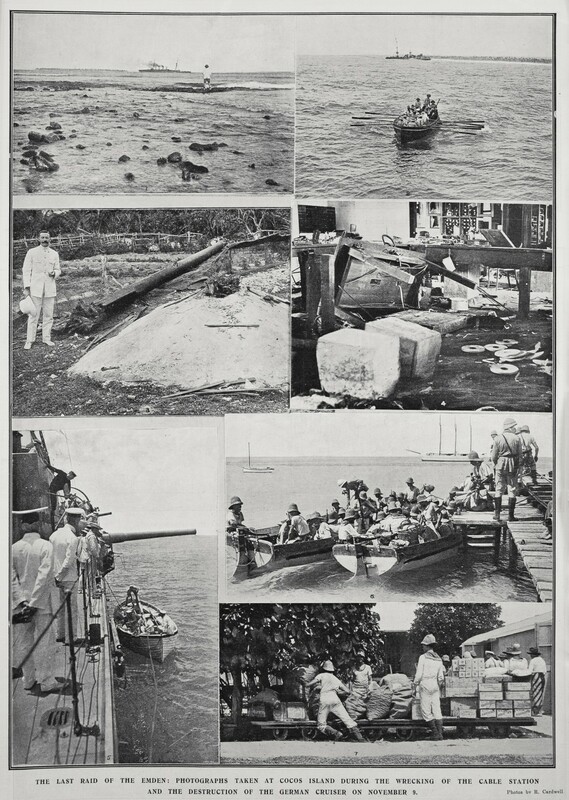 The lower right photos in the montage show the landing party getting stores ready and preparing to leave the island and make their final escape. Ref: R. Cardwell for the Auckland Weekly News, The last raid of the Emden, 7 January 1915, Sir George Grey Special Collections, Auckland Libraries, AWNS-19150107-39-1. Ref: Auckland Weekly News, Commandeered by the Germans..., 19 November 1914, Sir George Grey Special Collections, Auckland Libraries, AWNS-19141119-46-1. Von Mücke’s men sailed the Ayesha to rendezvous with the German freighter Choising near Padang in, what was then known as, the Dutch East Indies. 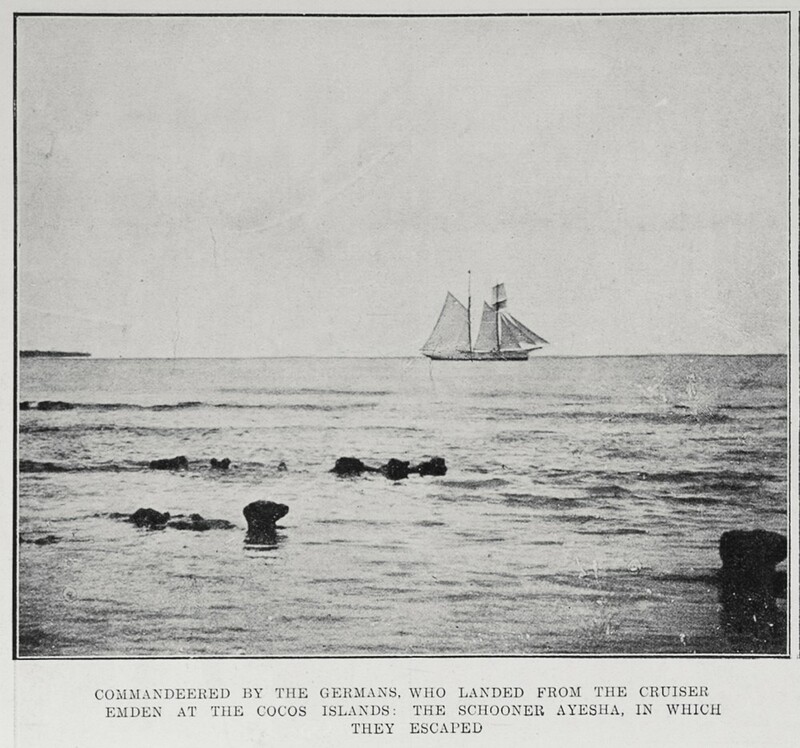 Choising took the men to the German wireless station at Hodeida in the Yemen at the mouth of the Red Sea, where they arrived on 9 January 1915. 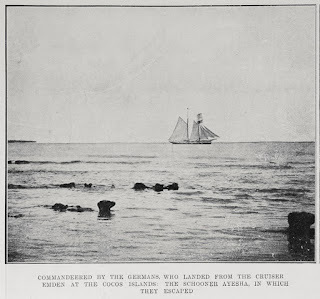 In Hodeida the Germans hired two sambuks (sailing boats) and sailed north along the coast. After one boat ran aground on a coral reef, they hired a larger vessel and sailed to Al Lith further up the coast of the Red Sea. From there von Mücke marched his men overland to Jeddah in Saudi Arabia. They were attacked by Bedouins and fought running battles for several days. Two sailors were killed and another was wounded before they reached Jeddah. After sailing up the coast to Al Wajh, they travelled by the Hejaz Railway to Damascus, and then travelled on to Constantinople which they reached on 23 May 1915. Truth is sometimes better than fiction!